The purpose of this blog is to meticulously collect and share stories, techniques, knowledge and passion for the outdoors. My hip was carefully placed up against the tailgate of the truck in an attempt to avoid shaking too much, so that I could focus better with my binoculars. I was looking toward the eastern field and standing just meters from the farm-house; scanning north to south and concentrating in and around the new hay bales which were freshly cut and rolled. It was thirty-one degrees Celsius and the heat was almost unbearable. The cattle were down by the creek getting some shade under various deciduous trees, while others waded through the cool waters. Once in a while some cloud cover would move in and with it a fresh breeze would blow in, changing the colors of the various weeds and hay. Earlier in the morning, I had climbed over the electric fence then headed down diagonally through the northern field closest to the farm-house and cut across the hedge row near the creek, just meters from the road. I then looped around to the south-east back into the other field where there was an opening for the tractors. I had noticed the groundhog several weeks ago in the field to the east but the weather did not roll in my favor with heavy rains. I was forced to abandon my hunt because the groundhog had retreated below the ground. The network consisted of two main den entrances at the start of the slope toward the west and with two other escape holes one near the fence to the east and the other in the center of the field where the grass was much darker and just high enough to provide good cover. Only a few minutes had passed and finally I made out what I thought was a small brown animal on its hind legs. So, I adjusted the center focusing wheel on the binoculars and confirmed my findings. I slowly unzipped my right pocket on the orange hunting vest and pulled out my cell phone and checked the time, it was almost three in the afternoon and it was now going to be cooler and the animals would start coming out now; birds too since I had only seen two yellow warblers and four grackles. I packed away my phone and binoculars, zipped up my pocket and then grabbed a single shell from my ammunition box on the tailgate and headed down the road to the north. I had to move quickly because I did not want the chuck to move underground. As I made my way over to the eastern field, I was studying the low ground and aligning the groundhog with each hay bale, thus identifying which bale offered the closest shot and then chose the right bale to use as cover. I decided on the second bale since it was slightly further away from the groundhog but directly in line with me. I moved in through the tractor opening for the second time of the day and turned in toward the low ground. Once in a while I would stop, catch my breath, because I was speed walking and crouched over. I normally pace myself and take about five to six steps then stop, listen and observe, breathe then set off again. I was closing in on the groundhog and he still couldn’t see me. By the time I reached the first hay bale, I was only thirty meters out and the shot was possible one but I could not guarantee a confirmed harvest. I also wanted my shot to end up in the dirt and not go over the fence toward the tree line. So, I stopped, took a knee along with a few deep breaths and prepared myself for the shot that would soon come. I leaned over to the right hand side of the bale and noticed that the groundhog was still standing on watch with its head very high above the hay. I then turned back in toward the center of the hay bale and got down on all fours and leopard crawled over to the hay bale to left or east. I would crawl, and then stop; look up just popping my head above the hay line to make sure the groundhog was still there and then I would inch forward again. Twice I had to wipe the sweat from my forehead with my hunting hat. My forearms were cut and burning because of the grass blades and various insects. It was only six meters away but it took me a while to get across to the other bale. Once I reached the second bale, I slowly stood up and had a look over the top of the bale and checked that the groundhog was still there. This time it heard something and let out a whistle but did not move instead it stretched its head further up for a better look much like me. I loaded one shell into my Remington 870, lined up the bead sight with the target using the hay bale as a stabilizer and focused on my breathing. Once I was ready, I took the weapon off safe using the quiet push method, and then slowly squeezed the trigger…Vlam! Grass and dirt spat up, the groundhog was ejected from the den and fell flat on its back side. 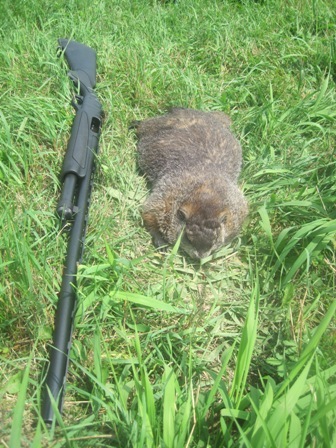 I had harvested one of the largest groundhogs this year and it was now time to head back to the truck and find the groundhog on the southern field near the second barn. I took the time to reflect on the hunt and feeling good about having helped a farmer with his varmints. I decided to bury this harvest using one of the abandoned holes in the field closets to the fence. A couple of hours had passed and I was now back at the truck having a drink of water planning my next hunt in the southern field. The cattle had moved in closer to the barns for the evening, therefore shooting was no longer an option at least in the southern field; I had to prepare myself and maybe pack up for the day and head home. I checked my 870 for a third time after my initial shot and cleared it to make it safe, then I carefully placed it on the ground near the truck on its cloth gun case. I then pulled out a granola snack bar and began to relax. Once in a while, I would look toward the south then over to the east. The birds were singing louder now, the red wing black birds and grackles were flying in low to feed off the grain on the ground nearby. I took another drink from my water bottle then placed it down on the tailgate and this is when something caught my eye to the south-east. I could not make it out at first as it stealthy made its way out of the tree line to the south just behind the fence about forty meters from where my harvest was buried. It blended in perfectly with the hay color. As it got closer and within range I was now able to identify my visitor, I could see its ears were straight up and its fur had a healthy golden shine. The animal would stop; look with its tail straight down near its hind legs. It was incredible! I had seen this animal many times before but I was fascinated, this time it was much different. It was only two hundred meters away just on the other side of the fence, she moved with such grace and prudence. Coyotes are very intelligent and extremely beautiful animals with an incredible sense of smell. It had picked up the scent of my harvest and she was going to get a free meal; this is something that I love about nature. The simple fact that nothing goes to waste and I was quite aware that my harvest would not last long in the soil. The coyote was moving in toward my harvest and I snapped to; so I grabbed my binoculars and headed down to the creek to circle around. 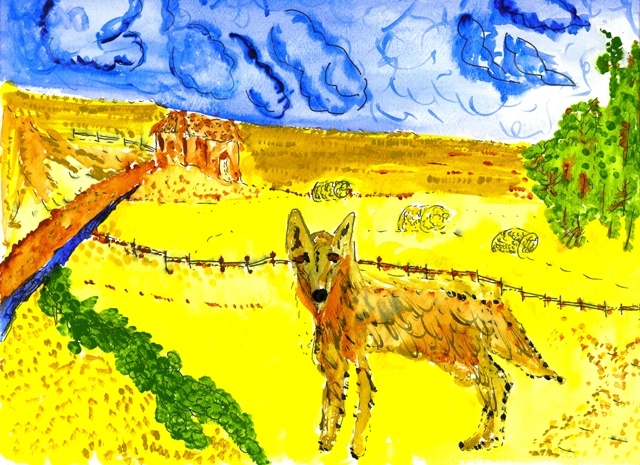 We were like two cowboys in a duel moving in toward each other but by the time I got to the edge of the creek, amid the excitement the coyote caught my scent and disappeared into the hay, through the fence and into the wilderness. I did not consider this encounter a failure but rather an awesome experience with an amazing animal. For that very moment I was proud as always to be part of this northern wilderness with this Canis Latrans. The truck drove slowly up the long dirt road between the north and south-western hay fields carefully avoiding the mud holes. The creaking sounds of the suspension faded into the country music that was playing low on the radio. Once we reached our spot, the driver put it into park and stopped at the top of the eastern ridge on the forest edge. It had been raining for a few hours now and the temperature was starting to drop at about six degrees Celsius, we had lowered our windows, so that we could hear the nightly sounds and hopefully get a gobble or an owl hoot. I then carefully swung my door open, stepped out into the mud and moved my way to the back to the truck, unzipped my hunting bag and grabbed my crow caller. It had been dark for about thirty minutes now and we were slowly sinking further into darkness. I cupped my hands around my mouth and started with a few owl calls and then waited a few minutes, then called again with my crow caller. This went on for a few minutes and would stop, listening with my hands cupped around my ears, and then I would start calling again. I was anticipating a call back from a gobbler but instead I heard crickets, geese from the lake nearby and some other nocturnal animals. The farmer had said that the field on our left was full of turkeys during the week and so we were attempting to find their roost. After a few failed attempts, we packed up and made our way back to the cabin for the night. It was going to be a short sleep because we wanted to be back on site about half an hour before sunrise in order to get the best setup. Since I had not located the roost, we decided that in the morning we were going to still-hunt along the edge of the fields just like Ray Eye had done in his book. You must exercise a great deal of discipline while moving through the woods and fields, know your terrain, be patient as well as have a good eye. Turkeys can hear and see extremely well and it is absolutely critical that you know and understand the game you are pursuing. It was now five in the morning and I awoke to some nice song birds. Within minutes we had eaten breakfast, which was a few pieces of toast and a cold glass of milk, and then we loaded the gear into truck and drove back to the very same spot. My good friend was carrying my decoys in a bag, along with green mosquito netting for cover. I had my Quaker Boy slate caller around my neck, a set of binoculars and my pump-action Remington 870. The hunt was on and we were extremely excited, we slowly moved our way east through some copse of trees between the east and western fields and as we broke the forest edge two deer leapt into the tree line to our right and disappeared. We decided to go up the left hand side of the field north-east of the truck and then cut across about half way through as there was a crest in the field leading to a point which offered a great shooting spot. As we slowly made our way up the forested edge of the third field, I went down on one knee and completed Wade Bourne’s Fly down Cackle hitting my hat against the tree bark and boy it sounded authentic. I must have alerted some animals nearby because within an instant of finishing my call a coyote came trotting along the field to our right and then when he saw us he disappeared just as fast as the two does. We did however find his meal left over’s which was a porcupine carcass. Several minutes had gone by and now after having seen some wildlife our senses were set to high gear and then almost every dark object in the fields looked like an animal. We must have taken around forty more steps and had stopped by a pile of logs when my friend tapped me on the shoulder and pointed to our left. We instantly took a knee and stared at the large black mark in the center of the field down in the low ground. As we looked on, I noticed that it was lifting and lowering its head but it was too far out to make out what it was. I whispered “It looks like a coyote” but my friend was not so sure, so I handed him my binoculars and he focused on the animal. He was several hundred yards away down in the low ground. Behind him was a beautiful valley and on its crest there were very large trees mixed with pine and aspen, oak and birch. To his north there was a very large hay-field and a small lake behind some more trees which formed a sort of barrier between the two features. To his south there was another field and it was on its southern edge where my point and best shooting spot was located. By the time my friend handed me the binoculars to have a look, he had already whispered back that it was a very large tom and he had a huge smile on his face. It seems that my calls had worked and he was spreading his wings in a feathered dance then moving slowly into the direction of my calls. He was all alone with no other turkeys in sight. We kept very low and slowly moved back toward the southern edge and decided to place the two decoys twenty-five yards from the brush. My friend walked back to the logs some thirty yards to the west providing me with a safe and wide shooting arc. Ideally, I needed to be further east on the point but I could no longer move as the tom was closing in on my decoys and would have instantly seen me. I tucked myself into the bushes on the edge of the forest my back facing south with my decoys slightly to my left to the west about fifteen yards out. I carefully placed my Remington 870 aiming directly to my front and lifted my slate caller and let out a few cutts, yelps and purrs. I would then lift my binoculars, look for the tom’s position and reaction. At first I could see him moving toward me but then he would fade into the low ground, and I thought to myself “Damn! He saw me.” Then I would see this very long neck pop up like a submarine periscope and then disappear again behind the grassy knoll. It was quite comical. What I found very neat is that he never once communicated with me, not even a few clucks or a gobble. There was one thing which was clear and this is that this tom was quick and he was in a hurry to see my hen decoys. He was now fifty yards out to my right, I had tucked myself away into a ball and pulled my camouflage hood over my head, I looked like a Real Tree bush with just my eyes moving, he was moving quickly but cautiously towards my two decoys. He would complete another feather dance which was just breath-taking and you could see his beard dragging along the ground. He would then tuck his head back in and move forward a few more steps, then stop and move yet again. My heart was racing like crazy and I kept on going through my shot scenarios and wanted to insure I chose the best time to take my shot, so I waited for him to walk directly to my front, I slowly raised my Remington 870 and unlocked the safety using the slow push technique which Wade Bourne had shown on his video. It made no sound at all, took my breaths and when he was twenty-five yards out, I lined up my bead sight with his head and neck and let out a shot of number four. It struck him by surprise and made him jump into a winged frenzy, I instantly leapt out of the bushes and while on my second step toward the bird I fired a second shot. Upon the second impact he spun around and the twenty-three pound beast fell to the ground. I had just harvested my turkey on the second day of this year’s season and it was all over in less than two hours. Brilliant! I may never meet Wade Bourne, Ray Eye and Preston Pittman in my lifetime but they were all present during my hunt. Thank you!